Video: E! Online REALLY Wants to Know Who Dug Up Russell Edgington! While on the red carpet for the season 5 premiere, E! Online decided to ask members of the True Blood cast who dug up Russell Edgington (Denis O’Hare). Everyone from Anna Paquin (Sookie Stackhouse), Stephen Moyer (Bill Compton), Alexander Skarsgård (Eric Northman) to kid actors Chloe Noelle (Emma) and Jacob Hopkins (Alexander Kent) skirted the question successfully. 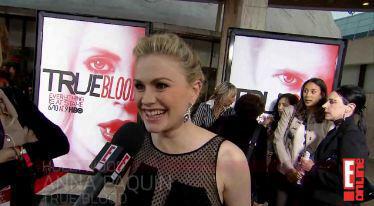 Watch the video below to see them answer the question and more regarding True Blood season 5!